Spend a day exploring the beauty and history of Ravenna and Ferrara with this private full-day tour. Visit the top sights in each city, including the cathedral and Castello Estense in Ferrara and the many gorgeous churches in Ravenna with colorful mosaics. Enjoy the personal attention of your private guide. Get picked up by your private guide in either Ravenna or Ferrara (or even Bologna) to begin your full-day tour of these two fascinating cities. Explore Ravenna's historic city center with a walking tour or a bicycling tour. Learn about the city's past dating to when it was the capital of the Western Roman Empire. Some of the spectacular mosaics in churches like the Basilica of San Vitale, Basilica of Sant'Apollinare Nuovo, and Mausoleum of Galla Placida are a testament to this rich heritage. Ravenna is home to some of the finest Byzantine mosaics in the world, which date from the 5th-6th centuries AD. Other sights in Ravenna you can see include the Piazza del Popolo, St. Francis' Crypt, and the tomb of Dante Alighieri. 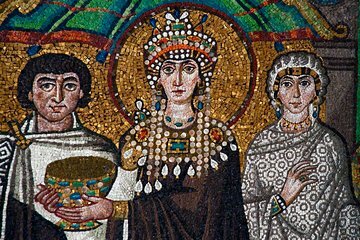 Hear about some of the famous people who have traveled to and admired Ravenna, including Lord Byron, Gustav Klimt, Oscar Wilde, and Sigmund Freud. Visit art-filled and UNESCO-listed Ferrara, a fine example of a Renaissance city. Enjoy a walk through its historic center to see both the Medieval and Renaissance represented in the architecture. See the impressive Castello Estense and the beautiful Romanesque cathedral. Learn how 300 years of rule by the Este family made Ferrara what many consider Europe's first 'modern' city – a planned city that blended its Medieval and Renaissance elements seamlessly.